Indications: Used for the treatment of the manic phase of bipolar disorder. May be used off label for other medical conditions. Summary Recommendations: Patients with manic depression or bipolar disorder should never stop taking one or more of the prescribed medications without the consent of their doctor; even if they become pregnant. Lithium is associated with birth defects, so the medication may be changed once pregnancy is reported. If there are no other medications available, the doctor and patient will weigh the risks of taking Lithium during pregnancy against the possible pregnancy/fetal complications. General Precautions: Lithium is prescribed to control mania. Mania is typically a symptom of a dangerous mental disorder known as manic depression. 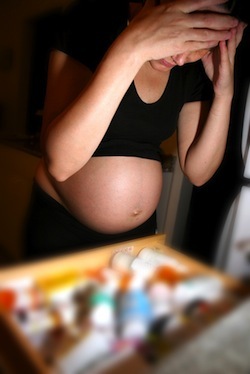 It is imperative to continue taking lithium as prescribed even after you find out you're pregnant. Stopping the medication abruptly can lead to serious side effects. Contact your doctor immediately to discuss the next, best step. If you are currently taking lithium for any reason, you should consider using one or more forms of birth control to prevent pregnancy. Lithium has been associated with birth defects. While taking lithium, try to stay hydrated and keep cool. The drug can affect your ability to drive and operate machinery. If you have a history of kidney disease, heart disease or underactive thyroid, your physician needs to know before you start taking Lithium. The therapeutic dose of lithium must be maintained accurately. Regular blood tests will be required to measure the amount of lithium in the blood. Effects While Trying to Conceive: Lithium has been shown to reduce sperm motility in male patients taking a therapeutic dose of the drug. This could affect fertility. Lithium is associated with birth defects, therefore pregnancy should not be a consideration when taking the drug. Effects on Pregnancy: Lithium is associated with fetal birth defects that affect the heart and other organs. Use of lithium during pregnancy should be reserved for cases where no other medications will provide the same therapeutic result. Rebound bipolar symptoms occur equally between non-pregnant and pregnant women who've stopped taking lithium. After delivery, however, there is a sharp rise in rebound in postpartum women. Safe During Breastfeeding: Lithium is passed into breast milk where it accumulates and passes on to baby during breastfeeding. Side effects may include lithium toxicity, cyanosis, abnormal ECG and hypotonia. Elevated creatinine, thyroid stimulating hormone and blood urea nitrogen have also been reported in infants breastfeeding to mothers taking Lithium.